How did no one know this was there? The Amazon River is incredible. As the second longest river on the planet, it holds some of the most interesting creatures and secrets between its banks. But the latest discovery by scientists is baffling: an enormous coral reef stretching for almost 600 miles. Two teams of scientists published a report about their find in Science Advances last week. “This is something totally new and different from what is present in any other part of the globe,” paper author Fabiano Thompson told the Smithsonian. “Until now, it’s been almost completely overlooked.” Spanning 3,600 square miles, from French Guiana to Marahnao in Brazil, the reef system is completely different from any other reef in the world. Although rivers are generally not conducive to the formation of reefs, this one appears to be healthy. Most rivers, because of the salinity and lack of light, disrupt coral formation. This one, though, plays host to a vast number of fish and sponges, the latter of which thrives in silty, dark waters. According to the study, over 70 different species of fish live in or around the reef, and many of them are carnivorous. Researchers are currently in the process of identifying 29 possible new species. Perhaps most surprising about the find–aside from the fact that it hadn’t already been found–was that it was a complete accident. Researchers from South America and the US were in the area studying parts at the mouth of the river where fresh water and salt water mix. 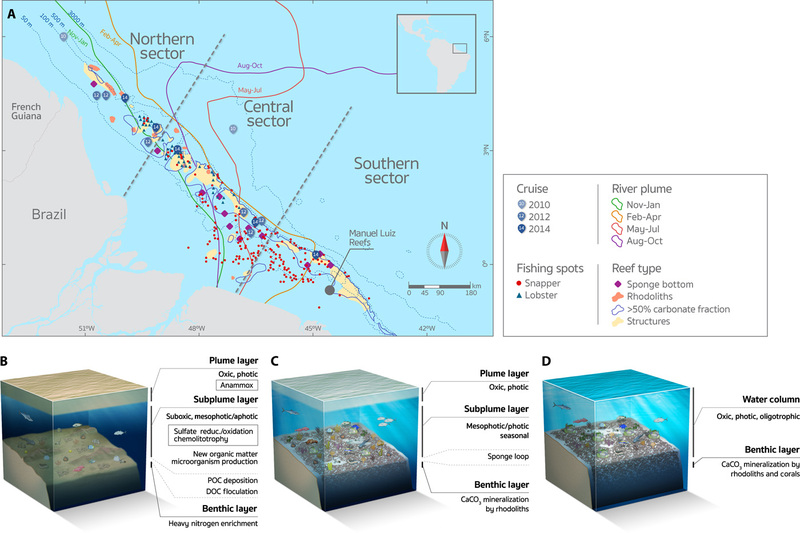 “Our expedition into the Brazil Exclusive Economic Zone was primarily focused on sampling the mouth of the Amazon,” explained Patricia Yager, the principal investigator of the project. Yager, though, had something else she wanted to find out. Rodrigo Moura, a reef ecologist from the Federal University of Rio de Janeiro, had an article describing a scientist who caught reef fish in the area back in ’70s. Because reef fish are found near reef, if the article was correct, there was something curious afoot. So Yager and her team went fishing. “We brought up the most amazing and colorful animals I had ever seen on an expedition,” she remembered. Although the find is an amazing one, it appears that the reef may be in grave danger. The area is being looked at by oil and gas companies as prospective new drilling sites. “From ocean acidification and ocean warming to plans for offshore oil exploration right on top of these new discoveries, the whole system is at risk from human impacts,” said Yager. Coral reefs around the world are suffering from elevated ocean temperatures and acidification, from Hawaii to Australia.